Please refer to our stock # W-CP1 when inquiring. 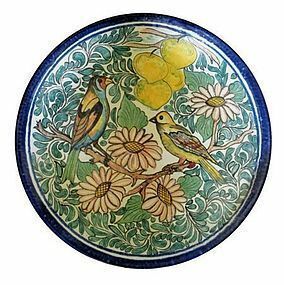 DESCRIPTION: A beautifully painted, very large Mexican charger (or platter) with a dark blue outer rim framing two birds perched in a tree, surrounded by scrolling green foliage, large flowers and yellow fruit. Dating from the 1960's, on the reverse is written "Mexico"; the back is pierced with holes for hanging. Excellent condition with no chips, cracks or repairs. DIMENSIONS: A large 18" diameter (45.8 cm).